The conventional computer mouse isn’t done evolving — in fact, it may have a role in securing our future computer systems. A network security engineer from Raytheon has found inspiration in smart guns to obtain a patent for a mouse equipped with biometric pressure sensors to authenticate users. Glenn Kaufman was recently awarded patent No. 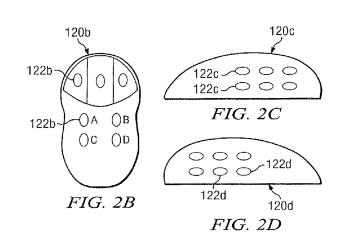 8,762,734 for a biometric pressure grip, which could be built into various spots on a computer mouse to get a user’s biometric signature in the form of a pressure reading. This kind of reading is harder to crack than facial recognition, retinal scans, or fingerprint recognition, since those forms of physical patterns can all be stolen in one way or another. Kaufman says the neurological pattern gleaned from the way someone holds a mouse is a superior alternative to other forms of security using physical patterns. “It’s not just how much pressure you exert on the mouse itself, but it’s also the x-y coordinates of your position,” Kaufman told Computerworld. So, for example, a mouse equipped with biometric pressure grip sensors would generate a neurological number based on the pressure readings from a user’s grip. That number would be compared to the registered neurological number for the computer connected to the mouse. If the numbers match, access is granted; if the numbers don’t match, access is denied. Kaufman tested a mouse with pressure sensors and used the results to conclude that it had a failure rate of one in 10,000, similar to the failure rate of pressure-sensitive gun grips. The Manhattan Stealth Touch Mouse uses pressure sensitivity, while Apple may be looking to update its Magic Mouse with pressure-sensitive functionality. However, neither leverages pressure sensitivity for security purposes. Kaufman says that his pressure-sensitive mouse isn’t meant to replace other forms of user authentication, and that Raytheon has no current plans to mass produce such a product. His patent notes that the form of the pressure sensor that could be used in computer mice could also be used in joysticks, palm pad controllers, remote controls and touchscreens.